Join the trip to most natural place in Bali. You will stop to some places around Bedugul in western part of Bali island. Visiting some water temples and mountain temple of Batukaru to experience the most beautiful temples in Bali. You will also stop at the widest rice terraces in Bali called Jatiluwih which has been acknowledged as the world cultural heritage by UNESCO. Your tour operator run this tour. 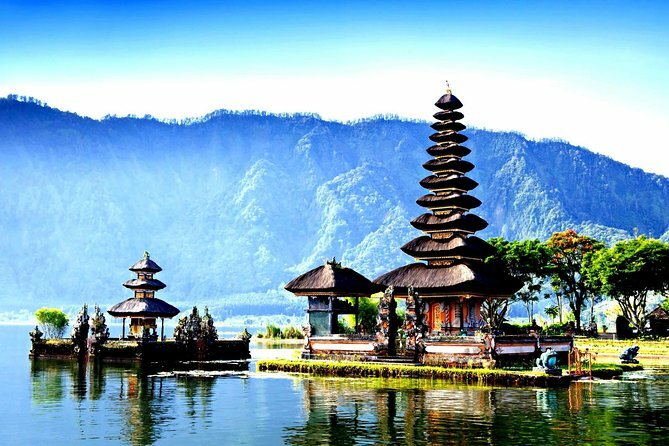 The drive will go to the first temple called Ulun Danu Temple. It is a temple floating on the famous lake of Beratan. It is a very important temple of water to worship the Balinese water, lake and river goddess Dewi Danu, due to the importance of Lake Beratan as a main source irrigation in central Bali. Stop at the widest rice terraces in Bali called Jatiluwih which has been acknowledged from UNESCO as part of the world’s cultural heritage in maintaining the local culture of irrigation system called Subak. Drive along the green hills to reach Luhur Batukaru Temple just on the foothill of Mount Batukaru as the second highest volcano in Bali. This temple was built in 11th century and was dedicated to the ancestors of Rajas of Tabanan. Enjoy the area of temple with a peaceful sound of nature and far out of tourist place. The last destination is Tanah Lot Temple to see the best sunset in Bali. It lies on the ocean that you can access only when it is in low tide. This 11th century temple shows you the most beautiful sunset experience in Bali. This is a great trip, we visited 4 sites in one day, from water temples to the templates on the ocean, the scenery is breathtaking. Our driver/guide was Dexde, he is very friendly and knowledgeable. Money worth spending on this tour.